Winner, winner, it’s American Chop Suey for dinner! 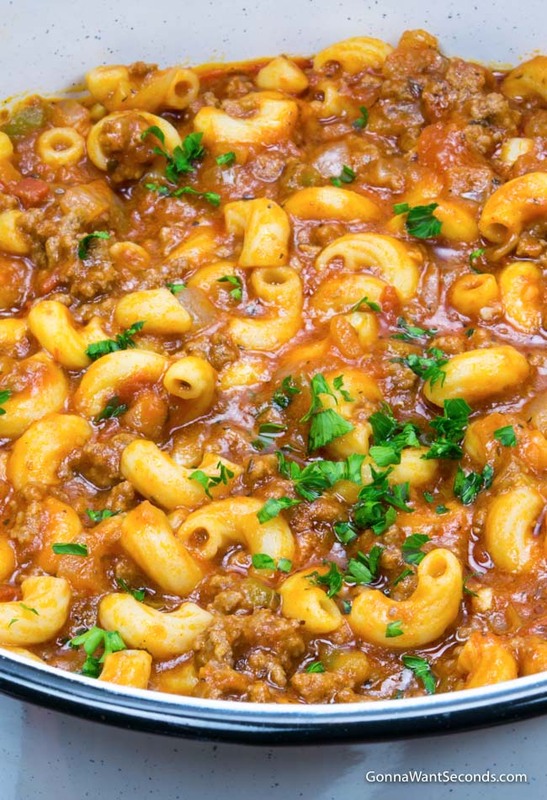 This Americanized classic is a favorite coast-to-coast, with savory bits of ground beef in a hearty tomato sauce, mingling with tender macaroni and melty mozzarella. Unfortunately, some days we’re stuck making do with what we have, combining whatever’s looming in the fridge or pantry to cook a “unique” (i.e., unpopular) dish. Rumor has it “chop suey” is a provocative name some parents use to lure children to the dinner table on just such an occasion! It can apparently be an effective tool for eliminating the groans and grumbles that often accompany these “creative” meals. The good news is the recipes for American Chop Suey are definitely not an afterthought; they’re a wonderful, deliberate combination of tasty ingredients you can serve for dinner without having to trick your children. As the name suggests, chop suey has some Chinese origin, though it’s possibly the brainchild of Chinese-American immigrants working on the railroads during the 1840s’ Gold Rush. These resourceful chefs had to make the most of what they had, which undoubtedly resulted in some unusual stir-frys. The Mandarin word for these “odds and ends” is tsa sui, and shap sui is Cantonese for “mixed bits,” so it’s easy to see how the pronunciation evolved to the name we use now. What is American Chop Suey? American Chop Suey is a classic American one pot dish consisting of beef, pasta, and a thick tomato sauce. It’s popular throughout the country especially in the Midwest, the South, and New England. American Chop Suey is one of many family recipes that have been handed down to me over the years, and this particular one is a favorite on my husband’s side. It’s definitely a family-specific kind of recipe, too, with subtle (or not-so-subtle) changes depending on who’s making the dish. Each family is also pretty adamant that theirs is the best. When people think of American chop suey New England comes to mind (there’s an American chop suey Wahlburgers version from the famous Boston-based hamburger chain). It’s a popular dish there that’s served at home, in restaurants, and even in school cafeterias, and it’s the one part of the country that consistently uses that name. 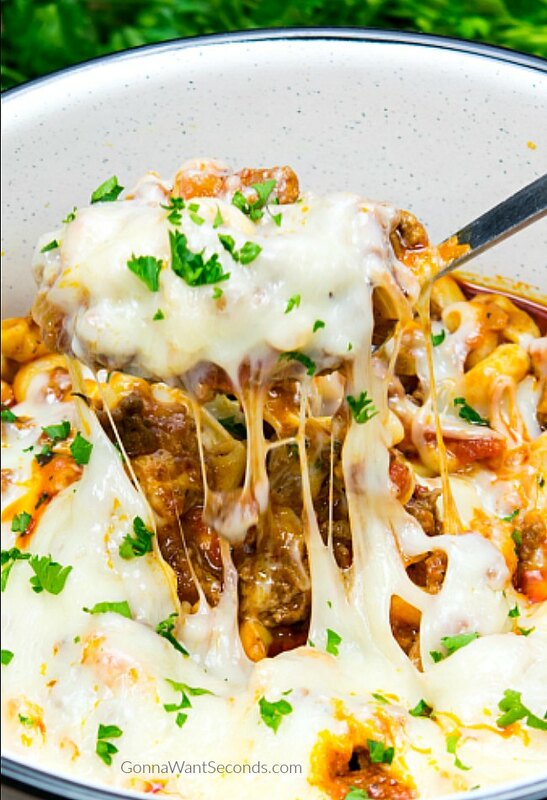 Depending on where you are and regional seasoning variations, it may be called Chili Mac, Beefaroni, or Johnny Marzetti Casserole (after an Ohio-based restaurant). 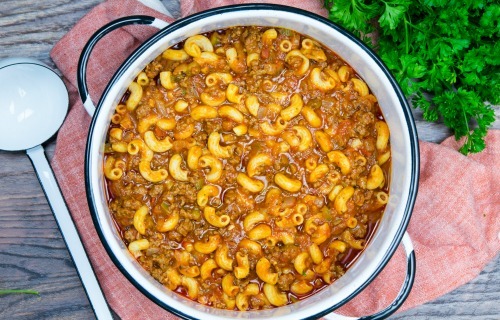 There’s also a Goulash dish that’s similar (here’s my version of American Goulash), but the truth is if you compare the two – American chop suey vs goulash, you’ll find the latter lacks the strong Italian-American influence you see in most American Chop Suey recipes. This dish has tons of concentrated tomato flavor, lots of classic Italian herbs like basil and oregano, and plenty of mozzarella. How do you make American Chop Suey? American Chop Suey is really simple to prepare and comes together in just one pot (hooray for fewer dishes!). Basically, all you do is saute the aromatics, brown the beef until cooked through, add the tomato products, seasoning, and spices and simmer, then add the pasta and when it’s al dente, top with Loads of mozzarella! I use a little butter to saute the aromatics and green pepper which adds some extra richness right off the bat. Butter is actually used in Italian cooking, believe it or not, not just olive oil, so that’s not necessarily an American addition. Next, we add a flavorful blend of 80/20 ground beef to create a meaty, substantive base that’s rich enough to hold its own against the hearty tomato sauce. Tomatoes are really the most prominent ingredient, and this recipe accentuates the full spectrum of flavors – from bright and acidic to rich and sweet – by using tomato sauce and crushed tomatoes. Tomato sauce is a combination of tomato paste and water, with a few additional spices or flavorings. The diluted version of the potent paste is less harsh (requiring less cooking time to mellow) but still a great way to enrich the cooking liquid. Don’t be tempted to make this American chop suey with tomato soup, though, since it’s a very different animal that’s diluted even more and usually has some added milk or cream. Using crushed instead of diced tomatoes serves one purpose – making sure every piece of the pasta clings to just as much of the tomato sauce as possible. This particular sauce formula makes a nice thick tomato gravy that really fuses with the elbow macaroni. By the way, if you only have whole tomatoes in your pantry, you can crush them yourself, juice and all, with a food processor or immersion blender for a simple substitute. One of the other things that helps make the pasta in this dish so flavorful is actually letting it cook in the sauce. Some recipes, like the American chop suey Serious Eats version, either pre-cook or soak the pasta before adding it to the sauce, but I think that denies the chewy macaroni pieces an opportunity to maximize their tasty factor. The seasonings in this dish are classic – a generous tablespoon of Italian seasoning and a touch of paprika to add a subtle sweetness and heat while contributing to the rich red color of the sauce. I add this wonderful sauce to almost all my beef dishes, and in my family’s version of American Chop Suey Worcestershire sauce really is an important part of the flavor profile. It wouldn’t be an Italian dish without some melted mozzarella, and I like to stir it into the pasta to melt a little so there’s some in every fork-full. I do sometimes serve a little extra on the side for sprinkling on top since there’s no such thing as too much cheese. I usually offer a crusty loaf of bread too, and maybe some roasted broccolini or a fresh green salad. One whiff and the kids will be anxiously waiting at the dinner table with no creative spin on supper required! Bake it – We all love one-pot suppers, but if you want some browned cheesy bits on top, you can make an American Chop Suey casserole. Once the pasta is al dente, pour the mixture into a lightly greased 9” x 13” dish. You can either mix in the cheese ahead of time or sprinkle it on top (or both!). Cover it with aluminum foil and bake in a 350-degree oven for about 25 minutes, then remove the foil and bake for about 10 more minutes until the cheese is melted and the casserole is brown. Lighten it – There are some American chop suey recipes 500 calories or less, and while I won’t go into a specific calorie count for this dish, you CAN take some steps to make it a little more waistline friendly. Use olive oil instead of butter and substitute lean ground turkey (93/7) for the beef. You can also use whole wheat or multigrain pasta and either skip the cheese altogether or use a low-fat mozzarella. This Easy American Chop Suey is a Classic American One Pot Meal. Simple Cheesy, lots of Beef and Pasta. One of the Best recipes to feed a hungry family. Heat the butter in a large pot over medium-high heat. Add the onions, green bell pepper, and garlic and saute until the softened, about 8-10 minutes. Add the ground beef, salt, and pepper and continue to cook, crumbling the beef with a spoon, until there is no longer any pink in the beef, about 5-6 minutes. Add tomato sauce, crushed tomatoes with their juices, water, Worcestershire Sauce, paprika, sugar, and dried Italian seasoning and bring to a simmer. Reduce the heat to low, cover, and simmer 20 minutes, stirring occasionally. Add the pasta, partially cover, and simmer until pasta is al dente, about 20-25 minutes. Sprinkle top with Mozzarella, cover and cook on low for 2-3 minutes. Remove from the heat and allow to rest, covered for about 5-7 minutes. Sprinkle with parsley if desired and serve. More Beef and Hearty Meals? Easy Crock Pot Beef Stew -This Beef Stew recipe has a thick, rich gravy. It’s loaded with lots of beef, mushrooms, potatoes, carrots, peas and great herbs! Vegetable Beef Soup – This is loaded with tender chunks of beef, incredibly rich broth, and all the right veggies! Beef Barley Soup – There’s almost nothing better than fresh veggies in a hearty beef vegetable barley soup! 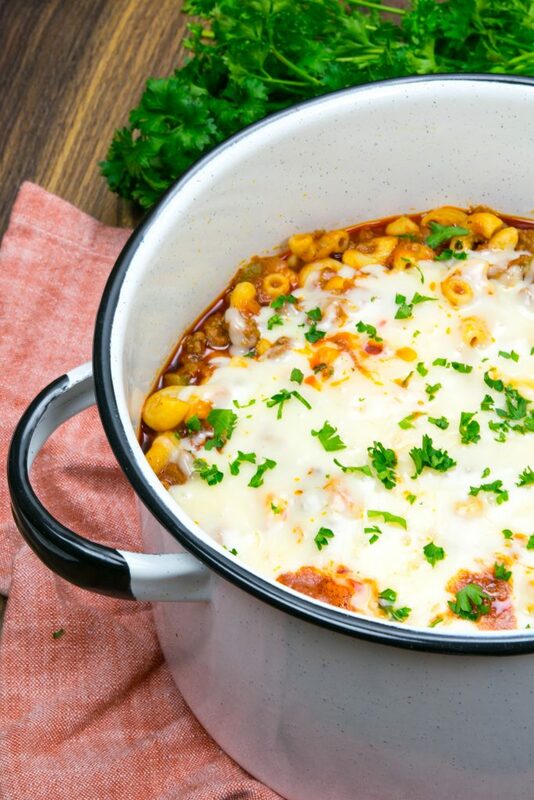 Easy Hamburger Soup Recipe – This is a home-style, hearty meal sure to satisfy healthy appetites. 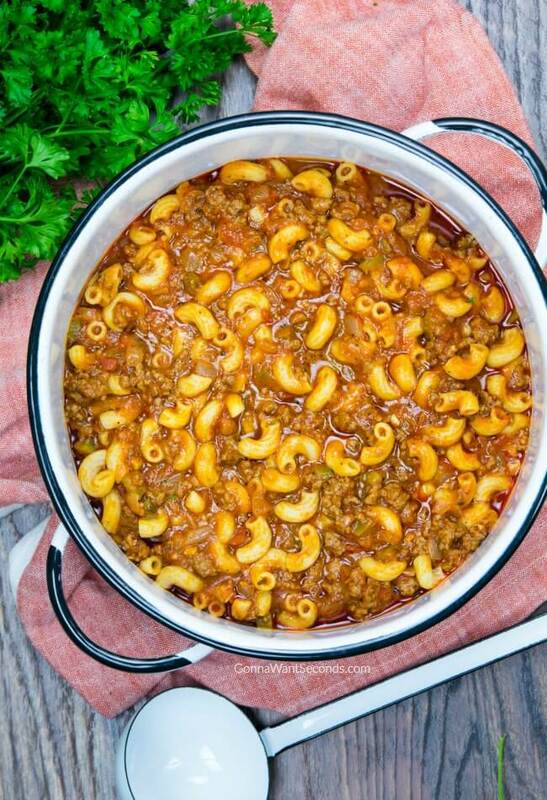 Crockpot Goulash – Whether you call it gulyas, gulas, gulyasleves, gulasin, gulasch, or plain old crockpot goulash, you’re gonna relish this humble beefy noodle herdsmen dish! Jambalaya – Take a trip down the bayou with the best Jambalaya recipe for busy cooks! This smoky, meaty entrée will conjure warm evenings with a zydeco beat. I have made this meal about 6-7 times now, and it is great, everyone loves it. I love that it is so easy to do, and if you prep the veggies ahead of time, you can whip this up in under an hour, so it works great, even on a weeknight. Hi, Bob! Glad that you like this! It’s so easy right? Leftovers are perfect too!